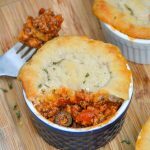 A hearty pot pie in a single ramekin serving, with all the meat & flavors of a pizza with a golden crust on top. Grease 6 ramekins. You can use butter, or non stick cooking spray, including the upper lip and down the outside a bit. Use the mozzarella cheese to completely, generously coat the insides of all 6 ramekins. Add/pack in the sausage, mushrooms, ham. and black olives, if using. In a small mixing bowl, add the sauce, garlic, and Italian seasoning. Stir them together to evenly combine. Then pour the mixture out evenly into each ramekin to cover the meat. Spread the dough out, and cut into six thick sections. Spread a section out over a ramekin, making sure to cover the outer edges, and pressing the dough against the dish to seal. Repeat to fill & finish each ramekin. Transfer the ramekins to a sturdy baking sheet. Lightly brush each crust with olive oil. Bake at 400 degrees for 12-15 minutes., or until the crusts are golden brown. Let the pot pies rest for 2-3 minutes before serving. Garnish with more seasonings, if desired.